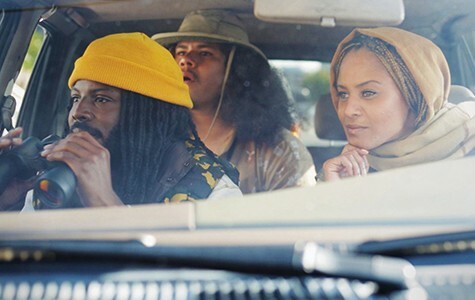 Left to right: Donte Clark ("Marcus"), Santiago Rosas ("Benny"), and Reyna Amaya ("Nina") in a scene from forthcoming local web series The North Pole. The first time Josh Healey heard North Oakland referred to as "the north pole," he was puzzled. "My friend Dania was like, 'Oh right, you're not from here. I'll break it down — here's the Mistah FAB song, and you need to know that people there are called polar bears, got it?'" 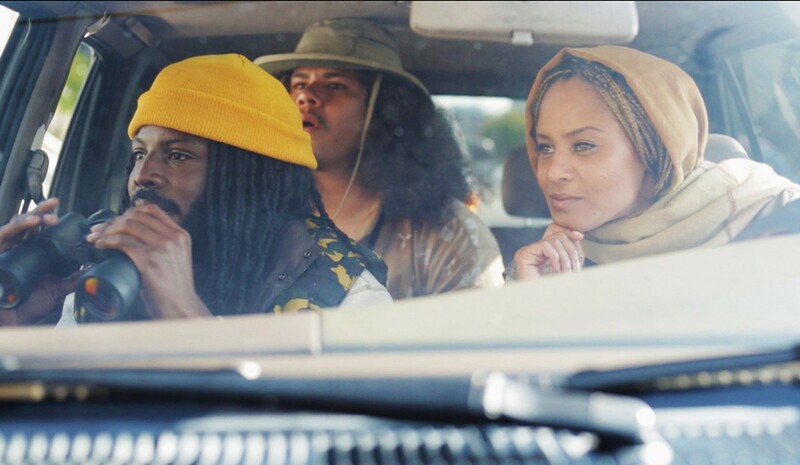 Years later, Healey, 32, is now the producer and writer of a forthcoming comedic web-series titled after the once-prevalent North Oakland nickname, The North Pole. The moniker neatly fits the characters and their quandaries: North Oakland natives, aka "polar bears," grappling with pollution and cultural erasure — much as the habitat of the real-animals. "The show is literally about going extinct," he said. Healey and The North Pole's lead actor, Reyna Amaya, 33, spoke to the Express while at an Eritrean coffee shop, Café Dejena, at the intersection of MacArthur Boulevard and Martin Luther King Jr. Way. Kitty-corner were boutiques built inside shipping-containers, anchored by a new beer garden, Arthur Mac's Tap & Snack. On another corner, an empty lot. They filmed most of the show blocks away, at the house of the friend who first explained "the north pole" to Healey, Dania Cabello. "Gentrification is everywhere," observed Healey, who grew up in Washington, D.C. "My folks back in D.C. don't say 'hella' and they don't know hyphy, but they'll recognize this neighborhood and the struggle." The first season of The North Pole, which has a Kickstarter campaign to cover post-production costs, consists of seven episodes that run seven-to-eight minutes each. The series depicts North Oakland sites such as Bushrod and Mosswood parks, Marcus Books, and Temescal Alley. Healey expects the show to premiere this spring or summer. It centers on Nina, a teacher and a North Oakland native, whose observations of displacement leave her dismayed and indignant. Her roommate, Marcus (Donte Clark), is an unemployed graphic designer. And their friend Benny (Santiago Rosas) is "the homie down the block, your ride or die," Healey explained. "He also reps the Latino, immigrant soul of Oakland." Amaya, who grew up in the Bay Area, said she was drawn to the series because it "highlights so many important things at once — gentrification, climate justice, and people of color and the environment. "A lot of the times, when you're chasing your dreams, you have to do projects you're not into — this isn't one of them." Isn't it intimidating to crack jokes about people losing their homes? "No, comedy is the core of what I do," said Amaya, who has a background in standup. "It helps truth go down easier, and it kick starts questions." "The No. 1 rule of political comedy is punch up," added Healey. "We're not making fun of evicted people, we're making fun of evictors and we're satirizing polluters." Cameos include one of North Oakland's most outspoken artists, Mistah FAB, and Oakland comedian and television personality W. Kamau Bell, plus writer and Coup bandleader Boots Riley (who voices Nina's spirit animal, a polar bear), and former Black Panther Party leader Ericka Huggins. One of Huggins' scenes required her to drive around Oakland during rush hour, with a camera on the hood of the car, while speaking to Amaya in the passenger seat. "It was complicated, and I was asking her if she was all right with it," Healey said. "And she went, 'I don't think it'll be more stressful than getting followed by the FBI.'" While filming this past summer, the show's themes seeped onto set. Two people in their crew received eviction notices. And, during an impromptu group discussion, they learned that the family of eleven next-door was facing eviction, as well. To Healey, it underscored the need for comedy: "Laughter is about reclaiming power." Healey, who regularly appears on NPR's "Snap Judgment," works for the grassroots environmental justice organization Movement Generation, one of the show's producers. Before that, he worked for Youth Speaks, which aims to empower young people through hip-hop, poetry, and spoken-word. "So, I've worked in every public school in Oakland," Healey said. "My goal is to make this hit for the kids." From Criterion Collection to New Yorker Presents.